Top > Study > Private informaiton > Is it all right that input personal information? ■ Is it all right that input personal information? There are a lot of web services that can't use if not put personal information. However we hasn't method to judge whether that service (site) is safe or not, right? As a result, there is it. Have you seen a site that the URL of that page begins not “http://” but “https://”? “s” that is added is an initial of "Secure”, and it has “safe” meaning. These sites are safe because there use the system called “SSL”. SSL is a system that encode the data when exchanges the data on the Internet. By do that, it prevent furtive glance the data on the occasion of exchanges by a third party. Of course you should be careful when you put personal information at a site that SSL isn't given . 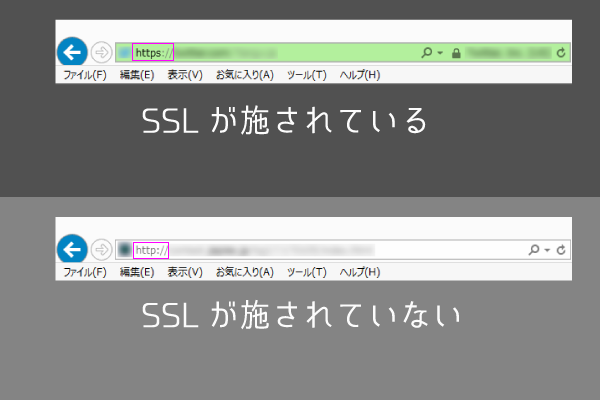 ▲Let's look at URL of the site to confirm whether that is given “SSL” or not. And it will be good to read “Security Policy” in a site. It is specified there that about how use user's personal information and how protecting it. If you worry, you should read it before you use a site. Communication when I use the site. The technique that it prevents being steeled a glance by convertering data according to a decided rule third person and from being tampered.